We are promoting various academic activities. 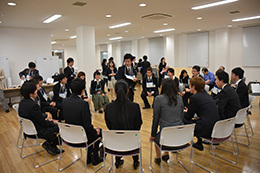 (2) To understand the SOKENDAI's broad range of intellectual fields, and create a network beyond your research field. This course consists of three sections: "Exploring Diversity in Academia (EDA)", "Researchers and Society," and, "Communication Skills for Researchers. ".